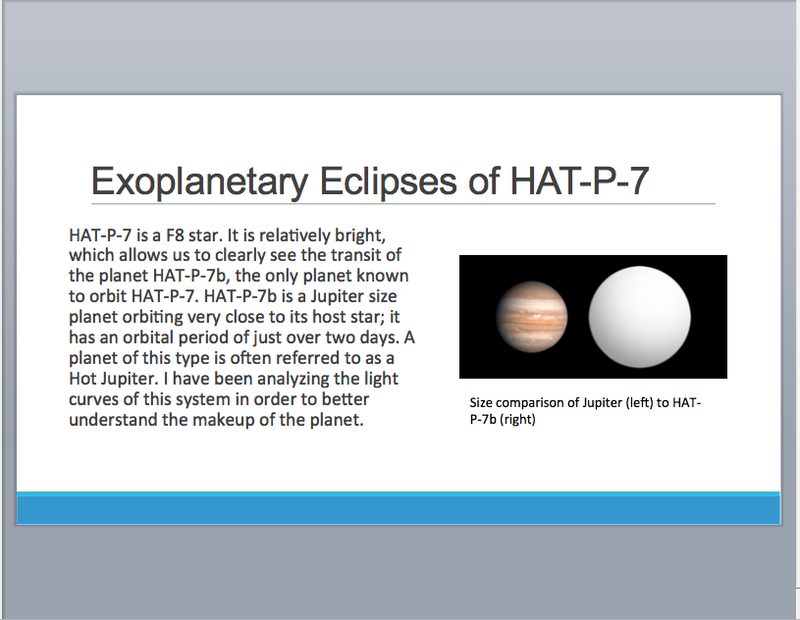 I’m gearing up for the K2 Science Conference next week and preparing my presentation. So this week at journal club, I thought it would be fun for everyone to give short presentations on their research projects. Jennifer Briggs talked about looking at secondary eclipses of the hot Jupiter HAT-P-7 b and how we’re trying to use variations in the eclipses to look for meteorological variability. I presented some preliminary results from our SuPerPiG search for very short-period exoplanets using data from the K2 mission. The practice talk was very helpful to me because I learned that I had way too many slides. We spent a little time talking about good presentation style and techniques, and it reminded me that Emily Lakdawalla of the Planetary Society put together a very good blog post about how to give a presentation. This week’s attendees included Jennifer Briggs, Emily Jensen, Karan Davis, Tyler Gordon, Hari Gopalakrishnan, Ahn Hyung, and Jake and Steven (whose last names I still don’t know). 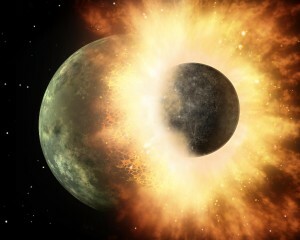 Artist’s depiction of a collision between two planetary bodies. From https://en.wikipedia.org/wiki/Giant_impact_hypothesis. We read a fun paper in journal club today, written by Inamdar and Schlichting of MIT that looks at the impact of large impactors on the atmospheres of gas-rich exoplanets. Among the surprising discoveries of exoplanet searches is a huge class of gas-rich planets between Neptune and Earth in size. 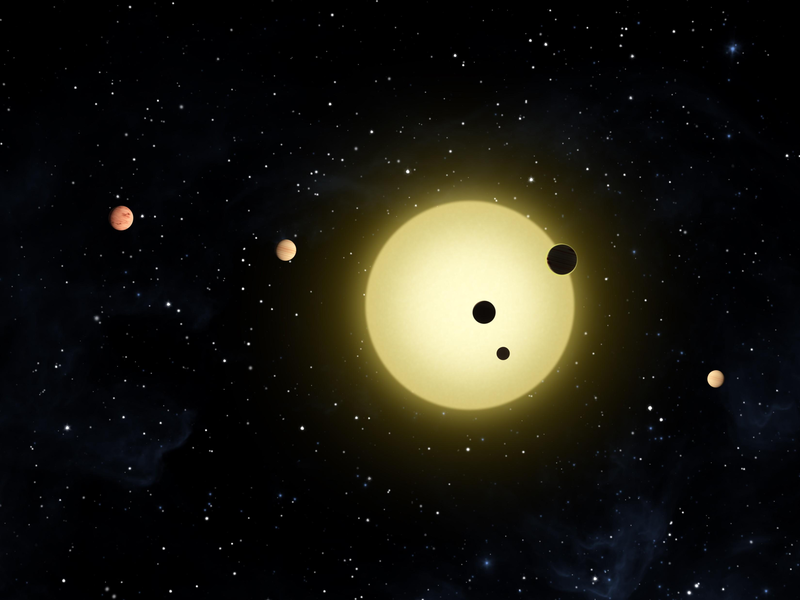 Called sub-Neptunes or super-Earths, standard models for planet formation predict these planets shouldn’t exist — either they should have remained as small as the Earth as they accreted or they should have quickly grown to the size of Jupiter or Saturn. We don’t have planets like these in our solar system, but they may be one of the most abundant type of planet in the galaxy. Even harder to understand, sub-Neptunes display a very broad range of densities, with some having densities greater than Earth’s and others with the density of wind-packed snow. This diversity indicates some planets have large rocky/icy cores with just a little gas on top, while others have tiny cores with bloated hydrogen/helium atmospheres. Since we think gaseous planets all form more-or-less the same way, it’s hard to explain this wide range of internal structures. Inamdar and Schlichting explore the possibility that giant impacts between young planets in these systems could account for this diversity. By applying a simple 1-D hydrodynamic model, they show that these massively violent collisions could easily remove large amounts of atmosphere from the young planets. Whether a certain planet experienced such a collision depends in a stochastic way on the initial conditions and gravitational interactions in these chaotic young planetary systems. So some planets would have experienced large collisions that removed a lot of their atmospheres, giving a high mean density, while others didn’t, leaving them low-density. These same kind of planetary collisions shaped the diversity of planets in our own solar system. For example, the Earth’s Moon formed as the result of a collision between the proto-Earth and Mars-sized object, named Theia. Uranus probably got its unusual tilt from a collision with an Earth-sized object early in its history. So even though most extrasolar planetary systems we know about don’t resemble our own, the results from this study show the same processes shaped them, and planets everywhere probably experienced a violent adolescence. Journal club attendees today included Jennifer Briggs, Karan Davis, Hari Gopalakrishnan, Tyler Gordon, Emily Jensen, and Jacob Sabin. Posted in: BSU Journal Club. Tagged: astrobiology, Cassini mission. 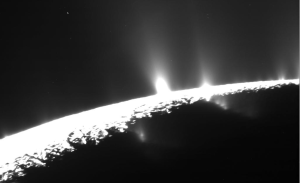 The geysers near Enceladus’ south pole. From https://en.wikipedia.org/wiki/Enceladus#/media/File:PIA19061-SaturnMoonEnceladus-CurtainNotDiscrete-Eruptions-20150506.jpg. Saturn’s moon Enceladus has inspired fascination since Herschel found it in the late 1700s. The discovery of active cryovolcanoes geysers** on its surface by the Cassini mission in 2006 raised that fascination to a feverous intensity. Although the source of energy powering the volcanoes geysers** was not (and is still not) understood, their implication was clear: Enceladus could have a sub-surface ocean, like his big sister Europa. The follow-up discovery of salty particles in the geysers all but clinched the existence of a sub-surface water source. Salt in the eruptions would probably require liquid water to dissolve rocky materials to produce the salt. But it wasn’t clear whether the sub-surface source is a small pocket of water directly beneath the geysers or a more global-scale ocean. 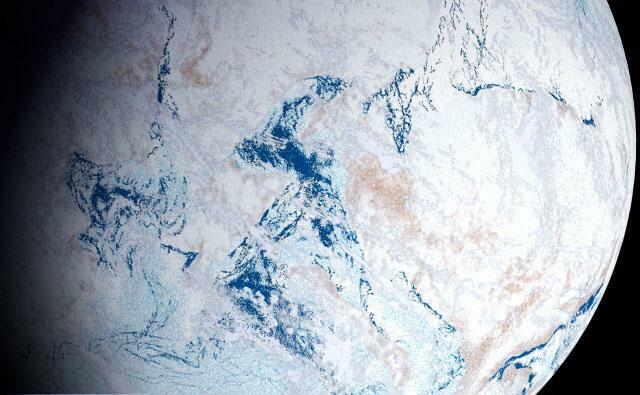 In our journal club today, we discussed a paper that points to the existence of a global ocean. The recently published study from Peter Thomas and colleagues analyzed Enceladus’ rotation to study its internal structure. By tracking the motion of hundreds of control points on Enceladus’ surface, they found that its outer icy crust oscillates back and forth during its rotation much more than it should if the moon were solid all the way through. Thomas and colleagues show that the large oscillations they found (called libration) require a large layer of fluid within Enceladus to lubricate the space between its outer, icy shell and its rocky interior. Otherwise, the moon would oscillate a lot less. Difficult to say exactly, but Thomas and colleagues estimate the ocean could be as thick as 30 km beneath an 20-km thick icy crust. Just as Europa’s ocean, a sub-surface ocean in Enceladus could represent an enormous harbor for life. Even on this tiny moon, such a deep ocean is only about a tenth the size of the Earth’s oceans*. Although Enceladus’ surface would be a tough neighborhood for life, sub-surface biota (if they ever evolved) would be protected by a thick layer of ice from the vacuum of space and interplanetary radiation. In fact, this same radiation could impinge on the surface and produce a steady supply of biologically useful oxidants, which could then trickle down into the subsurface ocean and help power the alien biosphere. Thomas and colleagues suggest a more detailed analysis of Enceladus’ surface geology, newly inspired by their discovery, might help unravel the history of the ocean. Similar analyses of Europa’s complex tangle of surface ridges and cracks helped piece together that moon’s geological history. Journal club attendees today included Jennifer Briggs, Hari Gopalakrishnan, Tyler Gordon, and Jacob Sabin. *Earth’s oceans are, on average, 4 km deep, much smaller than Earth’s radius of 6,400 km. Therefore, I approximated their volume as pi*(6,400 km)^2 (4 km) ~ 500 Mkm^3. A similar calculation for Enceladus’ ocean — pi*(50 km)^2 (30 km) ~ 24 Mkm^3. **Dr. Thomas kindly pointed out that there is some debate over the nature of the eruptions on Enceladus, and volcanoes is probably not the term to use. First, I would like to thank Michael Blanchard and Rena Drennon for their generous support of our PonyUp Campaign at Boise State. At journal club this week, we had to talk about the recent confirmation of flowing water on the surface of Mars. How did scientists confirm that water is flowing on Mars? They studied a well-known martian phenomenon, recurring slope lineae (RSL). These lanes of darkened martian surface occur seasonally, usually on the slopes of craters facing the Sun, and have been observed on Mars for a few years. Their seasonal occurrence on Sun-facing slopes pointed to the possibility that they result from flowing water, but since flowing water on Mars could be such a huge discovery, scientists have been very cautious about their origins; hence the obscure name. In the recent paper, Ojha and colleagues analyzed high-spatial resolution observations of Mars from the HiRISE camera to carefully localize the flows on Mars’ surface. They then analyzed infrared observations from HiRISE’s sister instrument CRISM to look for spectral evidence of salts dissolved in water. The salts they looked for aren’t like table salt but instead consist primarily of perchlorates. These chemicals can be toxic for us, but they are well-documented on Mars. Ohja and colleagues showed that the lineae exhibit spectral features consistent with dissolution of perchlorate salts. These salts are known to significantly lower the freezing point of water, so they could easily keep water liquid, despite Mars’ cold temperatures. Eventually, even this briny water sublimates at Mars’ low surface pressures, and the spectral features found by Ohja and colleagues fade as the linaea fade, presumably as the water evaporates on the surface. Why is this discovery so exciting? It points to the very real possibility that there is microbial life on Mars in liquid water deposits deep beneath the surface. Early in the solar system’s history, the life-giving soup of chemicals that rained down in meteorites on Earth probably fell on Mars. Conditions on early Mars could have been similar to Earths’, so life could very likely have arisen. Whether life still exists on Mars may just be a question of whether it could escape to subsurface oases bearing liquid water, whose existence is strongly suggested by this new discovery. It may be only a matter of a few years before we find life on Mars. In attendance at journal club this week were Jennifer Briggs, Karan Davis, Hari Goppalakrishnan, Tyler Gordon, and Emily Jensen.